Paliem beach (sometimes referred to as Kalacha beach) is a tiny cove that nestles between Keri beach to the north and Arambol beach to the south. It is accessible from both by foot, though the walk from Keri is longer and a little more challenging. The beach is comlpletely secluded, and not accessible by road. 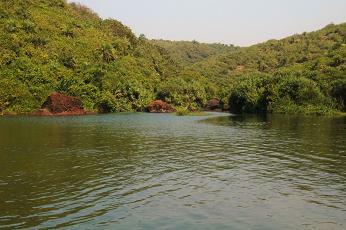 Paliem is well known amongst travellers in Goa for its sweet (fresh) water lake, and for the 'cleansing, sulpherous mud' that can be found around the lake. The days, however, of seeing naked hippies smeared in the yellow mud are over, and visitors pay for the experience, or scrape what they can from the banks of the small stream in the nearby jungle. The beautiful fresh water lake has a discernible magic to it, with the arms of the jungle about its shore and dragonflies flitting across its still, green surface. Just across the sand, the rougher sea crashes onto a rock studded beach, and dolphins can sometimes be seen on the horizon. From Keri you will have to go to the southern side of the beach, and begin the ascent of a rocky headland towards Paliem. There is a bit of guesswork involved - try to follow the paths and be prepared a bit of scrambling. As you round the headland, you will see Paliem beach. Follow the link for access to Keri beach. If you do this walk, I'd recommend taking a couple of bottles of water and a sun hat. From Arambol, the walk a bit easier. Head to the north side of the beaches where the spindly rocks mark the headland and follow a path around the shacks, stalls and cafes to Paliem. For access to Arambol beach follow the link. Shacks on Paliem beach sell the usual traveller's fare (noodles, muesli, pakora, Kingfisher beer, lassis e.t.c.) and sell mineral water, so you will not go hungry, but not be hugely inspired. Arambol beach has far greater choice. There are a limited number of huts on Paliem beach, and if you plan to stay here it may be worth trying to arrange a place early, so you have time to find a room in nearby Arambol if it is all booked out. Since the walk is short, it is feasible to come over from Arambol beach every day, if you should so wish. Between Arambol and Paliem, the Om Ganesh Cottages (tel. 0832/2242957) give a moderately priced option with excellent views, but you will need to book ahead, especially in season. Swimming in the sweet water lake is an obvious attration of Paliem. There are a few sunbeds set up by the lake shore, which you often have to pay for, though you might get away with half an hour or so without. The German/British run paragliding school (tel: 09822867570) - at the top of Wagcolomb Hill behind Paliem offers 20 minute flights for around R.1200 or courses for R.10,000+. Staying in the area, but want to avoid the crowds at Arambol? Head to quiet Keri beach or stay in Terekhol Fort, a luxury hotel across the Tiracol river at Goa's northern most point. 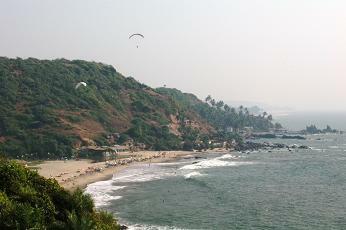 Is this your favourite beach in Goa? Let us know what you love about it on our favourite Goa beaches page!